I remember watching the tv show OC a few years ago and imagining what life would be like in southern California. I wasn’t sure if I would ever be lucky enough to visit. I was still a poor university student at the time and my idea of the good life was eating at T.G.I. Fridays at the casino in downtown Halifax. Even that was way out of my price range but we made an exception every couple of months. When I met Darren, my entire concept of reality went out the window. I was always an unrealistic dreamer and attempted the impossible, but within 6 months of meeting my now husband, we had quit our jobs in eastern Canada, sold everything we owned and moved to southern California. I was actually here. Our first stop when we arrived, before even finding a place to rent, was Newport Beach. Regardless of what happened from that moment, I at least set foot on Newport Beach. I never thought we would be able to afford to own a home here so renting was the next best thing. We even moved back east for a year because the thought of buying a house in SoCal seemed so out of our reach. But as I type this post, I am sitting in my own home in Orange County, California. Yep, the same OC I never thought I would visit I can now call my home. We moved in on July 1st. From the first moment I walked into the house, I knew I could call it home. 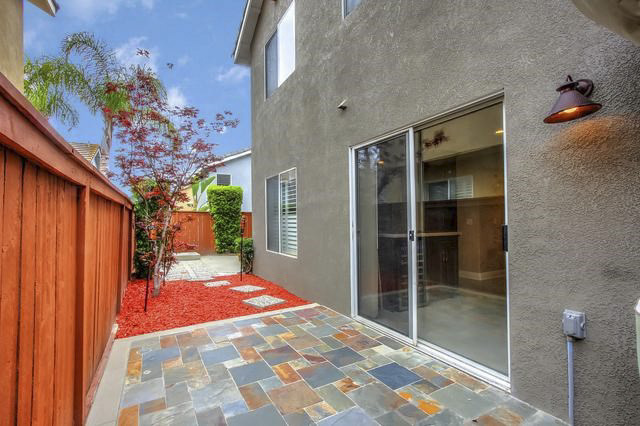 It’s small with a tiny backyard, but it is in the heart of Aliso Viejo and close to our dear friends. The neighborhood is full of children playing in the community and the corner lot gives us lots of light and air. When I look out the window in the living room and see the palm trees, it makes me smile and sometimes laugh because I am so giddy. The house was turn-key so it doesn’t require any maintenance or fixing but we’re excited to make furniture and other DIY projects. I chose colors for the living room today and already bought paint to change the coffee table. I look forward to making a rug for the front door as well. Darren’s first project will be a tv stand and then a dining room table. He will come up with the plans and do all the building and I will do all the painting and finishing touches. Our likes compliment each other perfectly. Everyone has a different version of complete happiness. Maybe you prefer the seasons of north eastern US. Maybe you prefer the skiing in western Canada. This is our happy place. We consciously thought about every possible option for living in the world and chose southern California, but I’m still in shock that this is my reality. I will continue to travel and explore the world but it is like I’m on constant vacation when I can call this home. This entry was posted in California and tagged California, Home Buying in California, OC, Orange County, SoCal by lesleycarter. Bookmark the permalink. Welcome to Southern Cali! It’s a pretty good place, I’m glad you like it. Look up Holy Jim Falls Trail, it’s one of my favorites in Orange County. Congratulations, Lesley. You dreamed big and achieved it! Nice! I hope you guys get much needed rain. God bless. Lesley, congratulations. It looks beautiful! I can’t wait to see what you do to decorate it. I am a New Yorker, but my husband is a Southern Californian and I have come to appreciate it. Our house was a reach, but I consider it my vacation, every single day and it has been totally worth it. You picked a great location. Have a ball! I can hear your happiness bubbling through your words! After the struggle to buy the home, I can appreciate how you are so happy to be moved in. I hope you will be blessed with a happy home life and that Athena makes lots of neighborhood friends. Enjoy putting down roots again. Your excitement comes through the writing. So happy for you; real estate in Cali is a nightmare, but you’ve reached the light at the end of the tunnel! What a gorgeous patio by the way! Congratulations! Welcome to Orange County! I’m originally from Laguna Niguel, right around the corner. I’m so lucky to be able to call such a beautiful place home, and now you can too! Congratulations! Congratulations on your new home. It looks lovely. Having grown up in Southern California in a place, La Jolla, even more beautiful the Newport Beach, I can understand your enthusiasm. Be sure that you explore not only La Jolla but come up north where I live now in the San Francisco Bay area and you will see even more of the beauty of California. I am going to move in three weeks in the Oakland hills that has a gorgeous view of the entire SF bay. And congratulations on your marriage. I found my “happy place” about 53 years ago and when I wake in the morning I still feel blessed. When you find that location where you feel you belong, well, you belong! Congratulations to your family for fulfilling a dream. Oooh! I like the wine cooler!! I so happy for you. I know this means a lot to you. We are currently working things to try to move to the beach. It’s been my dream since I was 14. The prices are scary though! But anything is possible! Dream big, right? 🙂 I hope you love your new home and live a long happy life there! It looks beautiful. Congratulations! Now you’ll have to find new adventures. Lesley, congrats. It looks great and yes, you are right. When you have a place you can call ‘home, you are always on vacation. There’s no place like home, especially when it’s your own. Congratulations, Lesley! What an amazing accomplishment and milestone. I’m happy you were able to move back to California and fulfill this dream! 🙂 Enjoy soaking up the sun and making your new house a home. Lesley, Congratulations on your new home in Southern California. Dreams do come true!! So happy for you guys…dream do come true! dreams coming true!…isn’t that the best! 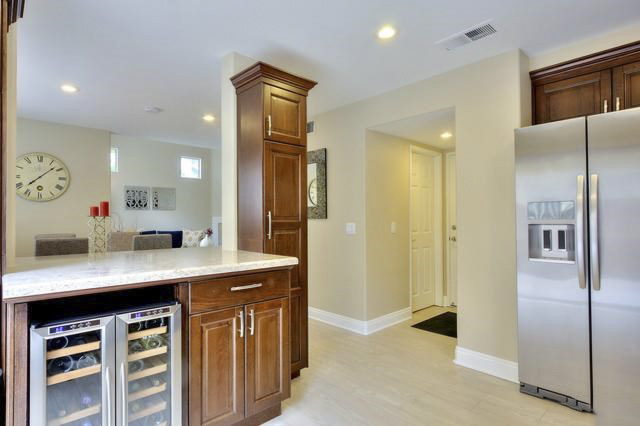 Very nice, love the kitchen area because I love to cook. Now that’s my idea of a back yard…now mowing and little maintenance. Congrats on your home, it’s quite an accomplishment. Congrats on you ally new home! It’s beautiful! Your post is filled with hope. Love that!!! I know yall are gonna enjoy each moment!! So happy for you! I also lived in Orange County (for 6 months), and feel the same love for it ❤ SoCal is an unforgettable place to live. I like you had always wanted to live on Cape Cod. I lived in many locations including in and around Toronto for 7 years. But by bit I moved closer to Cape Cod and now we have been homeowners here for 25 years. Anything is possible if you want it enough! We are not that far. =) After homebirthing my boy in our Irvine apt, I moved a bit inland. I still drive down to Laguna Niguel sometimes to see my acupuncturist: he is worth the drive. Glad you’re enjoying your new home. No place like SoCal!